The KV-85 is a Rank III Soviet heavy tank with a battle rating of 5.3 (AB/SB) and 5.0 (RB). It was introduced in during the closed beta testing for Ground Forces before Update 1.41. 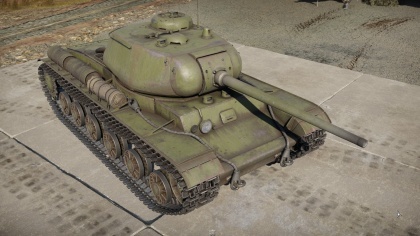 A KV-1 with a completely new and more powerful armament in its name, the 85 mm D-5, allows the Soviet heavy tank tree to have the firepower necessary to combat the other nation's Rank III vehicles. The KV-85 is a heavy tank, specifically an up-gunned variant of the KV-1 and KV-1S models built with an emphasis of engaging hostile armoured vehicles as well as a break-through tank. Operational and visual characteristics of the KV-85 retain the visual and operational similarities to the previous KV-1 line of heavy tanks of which it is upgraded from. Players experienced in operating previous models of the KV or T-34 series of tanks should have little to no difficulty in adjusting to this vehicle. The KV-85 can be distinguished from its KV predecessors by its enlarged and rounded turret and turret ring mount. A quick glance at this vehicle may be mistaken for similar looking tanks such as the IS-1 which shares the same turret and cannon. Although the armour thickness is the same as the KV-1S, this vehicle is notable for having a more powerful anti-tank gun shared by the IS-1 and T-34-85 (D-5T). 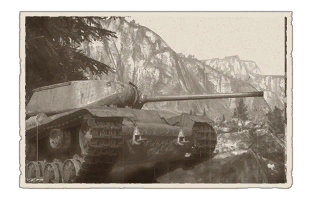 At 5.3 Battle Rating however, the tank armour will be of little protection against other hostile vehicles it will face. With just 75 mm front and 60 mm side armour, almost all tanks and the ammunition they fire (a significant number of which have double the penetration value of the thickness of the KV's armour) will penetrate with little to no issue. In comparison to other heavy tanks available in the USSR tree, such as the KV-2 models and SPG's, the KV-85's handling and combat style is very similar to the IS-1, being quite capable as jack-of-all-trades heavy tank: fast rate of fire, lighter weight compared to similar USSR heavy tanks of its Rank and Battle Rating, satisfactory mobility, fast turret traverse speed, fast targeting, good ammunition penetration and explosive filler. Although despite its limitations, a skillful and experienced player of this vehicle can tip the favor of balance on their side consistently regardless of the combat situation, be it long-range skirmishes or close-quarters combat. A 45 mm thick piece of armour lays on the boundary of the gun mantlet. Ammo racks of the KV-85. At its Rank and Battle Rating, the KV-85's armour is no longer up to par against newer and more powerful weapon systems of opposition vehicles it will face. Although unlike the IS-1 successor of which is unable to protect itself by angling due to the rounded turret mount causing a vulnerability, the KV-85 has less of this issue as the entire front potion of the front and lower-plate is designed to be straight and rectangular and allowing it to deflect or ricochet some shots when angled optimally. The tactical usage and efficiency sits somewhere between the IS-1 and the T-34-85 (D-5T); it is almost as armoured to par as the IS-1 in some aspects, but is not as fast as the T-34-85 whilst still retaining the same armaments. Although of an older design, the KV-85 makes a crude, yet still effective jack-of-all-trades vehicle sufficient in holding its own on the battlefield in many situations by experiences users. Another significant note of this vehicle is its considerably fast reverse rate, the second highest of its Rank and Battle-Rating for the nation's heavy tank line, topping at 14 km/h behind the IS-1's 17 km/h. Players can use this advantage to cross from cover to cover whilst engaging hostile targets or to make a tactical retreat. During situations where close-quarters engagement is expected, an unorthodox strategy can be utilized when the operator of the KV tank re-positions the vehicle 180 degrees and drive in reverse towards the enemy. By driving in reverse with the rear facing the opposition, the engine blocks make a crude yet somewhat effective shield and protecting the more delicate crew. Many opponents the KV-85 will face will fire APHE as its main ammunition armament; the engine blocks and fuel tanks act as spaced-armour and causing APHE to detonate prematurely prior to reaching the crew compartment. In situations where the operator want's the best chance of victory in a 'round-the-corner' head on engagement, the surviving crew after a first-shot volley may be given the opportunity for a retaliatory strike and second-volley after being hit. This tactic should only be utilized in a case-by-case situation basis where it is an absolute necessity, as the engine compartment will almost certainly catch fire when struck. This is of little issue if the user has Fire Extinguisher equipped. Be aware that this tactic is not suitable against opponents who fire solid-shot armour piercing shells such as certain British and American vehicles, as these will go straight through the rear, into the crew compartment and out the other side without stopping. Although equally capable and effective in operating alone, the KV-85 also operates efficiently with other friendly vehicles. Of note are vehicles that acts as bullet magnets such as the Churchill Mk.VII with its heavy armour and large target to act as a distraction or to soak up shots, whilst the user of the KV-85 or other friendly vehicles may trail behind it and fire off shots 'over-the-shoulder' to dispatch more powerful opponents of which the guns of the Churchill may have difficulty dealing damage against. Japanese tanks faced by the KV-85 are of little concern as their armour protection is largely inferior, as well as being relatively rare to tanks of other nations. Vehicles of American and British of the same Rank and Battle Rating are also less of a concern as their weapons and armour (excluding the Churchill Mk VII) are also generally inferior to some extent. When situation persists, hostile vehicles of German and Soviet origins should be prioritized first. Tiger tanks should be targeted 'between-the-eyes' of the front plate between the MG and driver's view port, or to the left or right side of the same front plate to set off ammunition racks. All Panzers models IV and below are of little concern - a single shot anywhere and everywhere will almost always guarantee to penetrate and destroy them. The Panther of which it may occasionally face will be invulnerable in its sloped front plate. Target instead the turret, or flank to the side and destroy with a single APHE shot. Good firepower with the 85 mm gun. Rectangular armour shape allows for good angling effectiveness. Player skill compatibility between older and newer T-34, KV and IS models. Insufficient flat armour that would be penetrated if not angled. Poor gun depression of -3°. Large gun turret silhouette and profile. Max speed relatively slow and inferior compared to contemporary tanks. Vehicle center hull is a mass of ammunition, fuel, and crew that can all be damaged with a shot to the area. At its introduction, the KV-1 Heavy Tank in Soviet service was one of the most heavily armoured tank in service in the world, it also has an outstanding firepower advantage over its contemporaries with the 76.2 mm gun. But as the war progressed, deficiencies in the KV designs were made to light; it was slow, not ergonomic for the crew, and was starting to become a setback due to the Germans being equipped with newer anti-tank guns. Plus, in a technical term, the T-34 medium tank could do basically everything the KV-1 could do (had similar armour ratings and same gun), but was more mobile and cheaper to produce. It was clear that if the KV tanks wanted to stay in service, it needed to be upgraded. First was the KV-1 Model 1942, which featured more armour, but still lacked mobility and had the same 76.2 mm gun. The first radical response to the tank design was the lighter KV-1S, which featured lighter armour, a smaller turret, a commander cupola, and a better transmission system. All this helped the KV-1 increase in mobility and speed, but it brought the question on why the tank was still being produced still as now it really had the same specifications as the T-34, but the T-34 was still a lot cheaper to produce than the KV tank. If this viewpoint didn't cause the Soviet heavy program to gradually die, then it was the appearance of the Panther tanks that convinced the Soviet command that their tanks need to have more armour and better guns. In order to help introduce a better gun into the system quickly while better tanks were being developed, the 85 mm D-5T cannon commonly seen on the SU-85 at the time was attached onto the KV-1S tank on a new turret from the developing IS-85 tanks. The new model, called KV-85, helped even the balance in tank firepower by being able to engage the Tiger I from a long distance. However, it was only a stopgap design and not many were produced due to the same 85 mm cannon equipping the standard T-34s to make the T-34-85, making the KV-85's firepower advantage a moot point. Plus, the development of the IS-2, featuring more armour and mobility caused the KV tanks to finally be declared obsolete. The KV-85 was produced from September 1943 to December 1943, with only 148 tanks produced. The KV tank series were succeeded by the Iosef Stalin heavy tanks, first with the IS-1, which featured a 85 mm cannon and effectively replacing the KV-85, then the IS-2 with its 122 mm gun that can kill most of the later German tanks easily. This page was last edited on 13 January 2019, at 17:32.